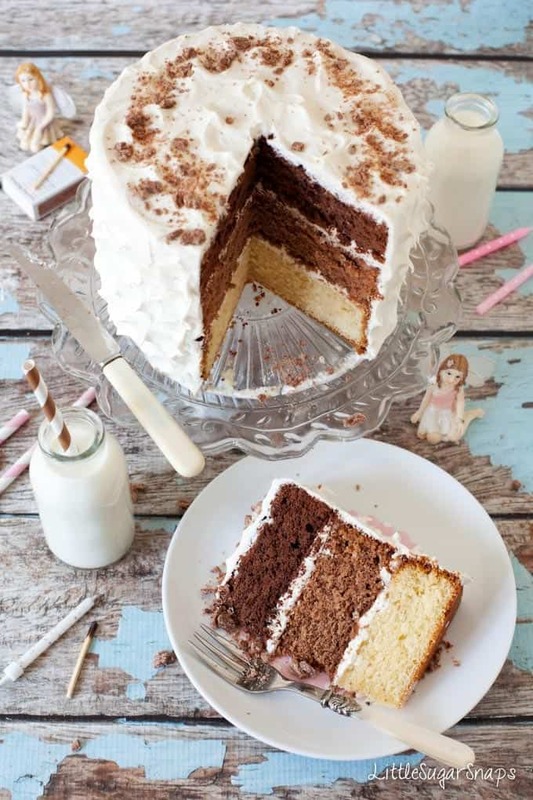 Chocolate cake gets an exciting makeover with three distinct chocolate flavours hidden beneath luscious vanilla marshmallow buttercream in this Triple Chocolate Layer Cake. It’s a simple but effective concept. March is my crazy month of birthday cake baking. This year, I think I smashed my record by making 4 cakes in the space of just 10 days. That’s a lot of eggs. A lot of icing. A lot of cake. It really is a cake-a-thon. 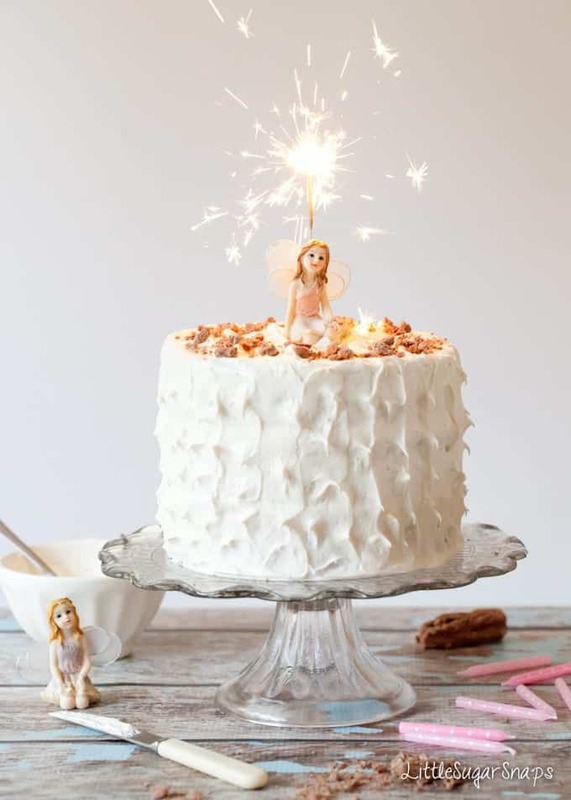 It’s now the last day of March and I’ve been so caught up in birthdays, parties and cakes that I have not yet managed to share with you the highlights of my cake dominated month. It’s time to correct that. First of all, I’ll be talking about this wonderfully indulgent Triple Chocolate Layer Cake with Marshmallow Buttercream that was my younger daughter’s birthday cake. And just to amuse you, I’m going to share with you my… um… major kitchen catastrophe involving a Piñata cake that I hope anybody about to attempt such a cake will learn from. The rest of you can just sit back and snigger wildly at my expense. Then there’s the topping of almost too good to be true, lusciously light vanilla marshmallow buttercream. It’s a regular buttercream with the addition of Marshmallow Fluff & flecked with vanilla seeds. This buttercream is my absolute favourite – you may remember it from my Pumpkin Pie Whoopie Pies. It is everything you could wish for in an icing: sweet, light, fluffy, easy to spread and, without a doubt, a step up from standard buttercream. I knew I was onto a winner for my girl with this Triple Chocolate Layer Cake. She adores chocolate & marshmallows so to have a multitude of chocolate all stacked up into a birthday cake and then include marshmallow in the icing was like a dream come true for her. I try hard to make Hannah & Milly a cake for their actual birthday that I know they will love. Something that ties in with their personality. Something a little different. Yes, this Triple Chocolate Layer Cake is essentially a large chocolate cake. But the different layers that are revealed once the cake is cut into takes it over the edge. It is far more exciting than a typical chocolate sponge and that’s why it was perfect for Milly. 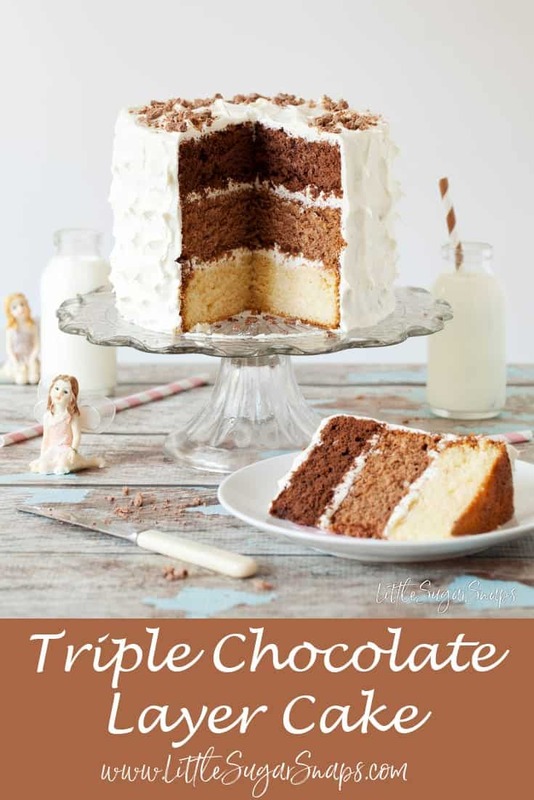 I’d say this Triple Chocolate Layer Cake is ideal for any chocolate lover – child or adult. It was a hit with everybody around our tea-table. One or two people picked out their favourite layers, but most, me included, just fell for the entire bundle. Please note: the recipe listed is for a three layer cake made in six-inch cake pans but I have included some instructions on scaling up to large pans in the recipe notes. Guess which one my girls like? Yes. The chocolate dome. One way to make that dome is to cover a blown up balloon in melted chocolate. Once set the balloon is popped and a perfect dome of chocolate is revealed. Last year I made them both one of these Piñata cakes without a hitch. (Well, almost no problem apart from a slight accident after it was made.). Confession: this year I got complacent. Just because I managed it last year no problem, it never crossed my mind that anything would go wrong. Obviously, things went spectacularly wrong. Picture me covering a large balloon with 400g melted chocolate. Now picture that balloon bursting and flying all around my kitchen. It made a lot of mess. I think I was wearing about 100g of melted chocolate at that point. Are you laughing yet? It gets worse. Please don’t judge me when I tell you that in my chocolate splattered mind, I quickly assumed that the balloon must have been weak. So, not only did I blow up a second balloon but I also switched places in my kitchen to get away from the mess that the.. er…. accident had created. I set to work covering this second balloon. And no, I really didn’t see it coming. This time I gave up. Every wall in my kitchen was covered in chocolate. The floor. The ceiling. The Clock. The fruit bowl. Me. Even the inside of the toaster took a hit. It was as if 2 chocolate bombs had exploded. I threw in the towel, threw my clothes in the wash and threw myself into the shower before starting the clean-up of my chocolate laden kitchen… The clean up that would take in excess of 3 hours. Thirty minutes into the clean up operation I came to the bowl that had contained the melted chocolate to find that what remained was still liquid. That’s when the truth hit me (like a wet balloon covered in chocolate right between my eyes): those balloons were not weak, the chocolate was far too hot. What had I been thinking? More to the point, why hadn’t I been thinking? The cause of my problem was suddenly so ridiculously obvious to me. Having lost my mind and 300g chocolate 45 minutes earlier, I found myself confidently blowing up a third balloon and giving it a go with what remained of the now cooled, but still liquid chocolate in the bowl. Success. The chocolate dome was made. Later that day I collected my girls from school and told them the grim news: the Piñata cake was ready, but it would be the last Piñata cake I ever make. To which Hannah replied that she would do it next year. Nooooooo. If you’re considering making a Piñata cake, take my advice. Don’t do it. Go for the Triple Chocolate Layer Cake instead. It’s not only far tastier but it’s infinitely easier to make. But please, please, do share your kitchen disasters with me – I can not be the only lunatic out there, surely…. Chocolate cake gets an exciting makeover with three distinct chocolate flavours hidden beneath luscious vanilla marshmallow buttercream. Simple but effective.Please note: this recipe uses 3 x 6 inch circular cake tins. If you are using standard 8.5 inch tins please see my notes below. Once the final layer of cake has been added, carefully spread a thin layer of icing all over the top and sides of the cake - a palette knife is good for this. I find that coating the cake in a thin layer all over helps to seal in the crumbs. Once you have done this, use the remaining icing to create a thicker layer that covers the cake entirely. This recipe uses 3 x 6 inch circular cake tins. If you wish to use standard 8.5 inch tins, my suggestion is to simply double the recipe. In an ideal world, you would scale up the recipe to bake it using 5 eggs, but that leads to some fiddly measurements. Making double is far easier - just ensure you do not fill your sandwich tins more than 2/3 full with the batter and use the leftover batter to make a few cupcakes. You perhaps will not need to double the buttercream though - I'd suggest making 1.5 times that stated in the recipe. Woah, Jane! 4 cakes in 10 days? Color me incredibly impressed. Cake’s a bit tricky for me too, so consider me doubly impressed! Your Triple Chocolate Layer Cake with Marshmallow (!!) Buttercream looks heavenly. Just heavenly. Wow. The 2nd version of the piñata cake… just wow. So was the chocolate too hot for the balloon? Goodness, the whole scene sounds like such a nightmare! Okay, major props to you for having finished that cake anyway. Consider the rest of us legitimately forewarned. Btw, Jane, I was completely gripped during that entire tale! Thanks for sharing this amazing cake. I now have the wisdom to appreciate that it is not a piñata cake. Haha. Have a great weekend! Hi Demeter, thankyou. They are lucky little things, but they so deserve it! I much prefer regular cakes like this one to themed cakes, but while they are young, I’ll indulge them for their parties. So far I’ve done numbers, the piñata (once too many times – yes the chocolate was far too hot), teddy bears, roller skates, a treasure island, a love heart and a great one this year for the number 10 – a glass of cola and a pizza. I can’t help but wonder/ worry what’s in store for next March! Do you think this cake would with stand fondant? A beautiful cake by the way. It looks so impressive. A real labour of love. Thank you for sharing it. Hi Mary. Thanks for getting in touch. I see no reason why not – I’m appalling at fondant icing, but let me know how you get along. Wow this cake looks amazing & I love the ombre layers! I had a crazy month of cake baking too, think I need a break for a while before my next cake! Thanks so much, Michelle. The trouble with life is so many cakes to bake and not enough time to eat them all – this is one of my new favourites though. Ha! Ha! Let me take a moment and compose myself. Chica. . .you sure are brave to attempt to make that darn dome a third time. After the first explosion, I definitely would have be done with it. . .like for the rest of my life. But such is a mother’s love. Only one question remains. . .are you still finding bits of chocolate here and there? Every time I see this cake pop up on my screen I have to stop and admire how pretty it is – you’re a star! I’m hoping to make it for my daughters birthday coming but will need to increase the size. I have square tins 27.5cm – I was going to make the batter base for each layer on its own rather than splitting into thirds. Do you think this would work and if so what would your recommended increase of the chocolate additions be – simply tripling? Thank you – it is an inspiration. Hi Nikki, I’m so thrilled you like my cake. Pleeeease send me a photo when you’ve made it. Wow 27.5cm cake tins, that’s going to be a deliciously large layer cake (I whole-heartedly approve). Allow me to get technical…. My measurements are for 3 x 6inch (aka 16cm) circular tins. Each tin has an area to fill of approx 200cm squared or 600cm squared in total (3x200cm). Your square tin of 27.5 cm has an area of 756cm to fill, which is a little larger than the total for my 3 circular tins. So… yes, you’ll definitely need at least the entire base for each layer – I’d expect slightly thinner layers though. And yes, I’d recommend just scaling up the flavour measurements by tripling them. If you wanted to ensure thicker layers, I’d add a third extra of everything for each layer as well. So 60g butter & sugar, 1 egg, 1.5 tbsp milk, 60g flour, 3/4 tsp baking powder plus an extra third of each flavouring. If the mixture looks too much for the tin you can always convert the leftover batter into cupcakes. Best of luck. Awaiting your photo eagerly…. Thank you so much for responding – I will definitely post a pic for you, her birthday isn’t until 4th June which gives me some time to play. I’m a little hesitant to play with your cake as it looks perfect as it is – but having a large family 10-12 serves doesn’t cut it! 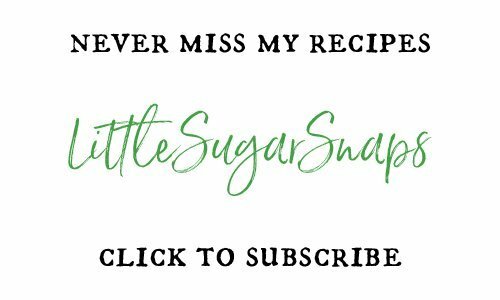 and omg thank you for the baking parchment tip – I quite often increase recipes and crunchy edges ensue – I had never thought of something so obvious! A pleasure to help you Nikki. I really hope it works out well. The cake looks divine ! Question for you, my soon to be 15 year old son’s birthday is coming up and being a soon to be 15 year old he has little preference to his cake or anything else. But he’s requested marble cakes before and chocolate so I think he would love the layers on this one . Here’s my question do you think a chocolate malt frosting would compliment this cake? I have a recipe I want to try and would love to try it with this one , or do you think you could add the malt to your frosting with success? Thanks so much! Thanks! I’m looking forward to making it this week! Hi Jane. I was looking at making this for my sons 3rd birthday to take to playgroup. If i leave out the dark Chocolate layer as it may be to much. Will it be to sweet with just the other 2 layers? Hi Amanda. I’m so glad you’re tempted by it. Personally, I’ve never know a child find any cake too sweet. An adult may well prefer to have the serious dark layer in, but for kids I think it would be fine. You could always just frost the top and middle of the cake and leave the sides exposed to cut down on the sweet buttercream if you wanted to. I may make a “tester” first. I never thought of the buttercream. With the cream cheese to cut through the icing sugar is it a sickly sweet buttercream? It is sweet, no doubt, but in a good way with the extra additions of cream cheese and marshmallow fluff. I think of it as posh buttercream – still very sweet but less sickly than normal buttercream. Hi Jane sorry to be a pain. I’m in NZ and the supermarket has marshmellow cream not fluff is that OK? I want to make my “tester” one this weekend. Really i just want some without 20 odd kids digging in but let’s call it a tester. Hi Amanda – no worries. Um, I’m not familiar with marshmallow creme. I’m in the UK and can buy the American Marshmallow Fluff, which is like a soft, gooey, spreadable version of marshmallows. If Marshmallow Creme is similiar, my guess is that it will probably suffice. I hope that helps. Hi Jane. The 1st of of the sponges is out. I didn’t measure the pan as I assumed it was a normal size so the layers are really thin. Lucky it’s a tester. But I noticed the white choc layer is holey? Has air holes all through it when I pulled out of oven. Did I over work the batter? Hi Amanda. yes, the recipe is for a smaller than average pan. If you want to bake 2 layers in 8 inch tins, I’d suggest making the entire recipe and dividing between the tins. You’ll need to increase the flavourings for the white and malted milk chocolate by 1/3 to do this. How strange that only 1 layer is affected. I’ve just googled ‘holey sponge cakes’ and the suggestion is either too much raising agent (in my experience this also causes the cake to sag) or over working the batter. Apparently long strands of gluten develop causing too much air to get trapped. Since only one layer is affected, this seems the most likely cause. Made the cake for my husband! Did not had the 6 in, just a 8.5, I had too made an half more recipe too have a much more bigger cake! I had trouble with the chocolate too…It kind of got hard when mixing cake mix with the chocolate so I got all little pieces of chocolate in the mix! I was almost depress but licking the bowl encoourage me it was sooo good! The result was really nice even if each of the cake were not as thick as it should be! It was yummy and everyone enjoyed it! Sorry for my bad english! Hi Claudine, I’m so pleased you enjoyed the cake. I’m going to put a note with measurements onto the recipe to help guide people who need to make it in 8 inch tins – that should help. Re the chocolate going hard, it sounds as if it started to set before you got to mix it in thoroughly. I had the same issue when I made chocolate mousse recently – it was lumpy but still delicious. Ideally, you want to mix the chocolate and the cake batter within 5-10 minutes of melting the chocolate. And similar to mixing a tablespoon of egg whites into melted chocolate when making mousse, it’s important to quickly stir a tablespoon of the cake batter with the chocolate to help stabilise the chocolate temperature and stop it from seizing in the cake mix. I hope this helps for the next time you make it. Jane this cake is totally EPIC!! Beautifully made and photographed I can’t believe I haven’t come across it before. LOVE. Thankyou – I feel the need to bake it again soon. Just found your wonderful looking cake and am thinking of making it for my husband’s birthday or for Easter, but with a regular chocolate buttercream frosting or even a ganache. Can I ask how tall your 6in cake pans are? I am an expat in the US and the only 6in pans I can find are a measly 3/4in tall and your cake’s layers look taller than that! I need new 8in pans so while I was ordering thought I’d splash out on 6in too, but not if they are going to be too short. Otherwise we have visitors from home coming soon and I might be able to persuade them to include cake pans in their luggage! Gosh, Melanie, those are short pans. My mum had some like that years ago. My pans are about 1.25 – 1.5 tall ( not able to measure them at the moment). In my notes you’ll find suggestions for measures for 8 inch tins but if there’s only a few of you it will probably be too much cake to handle (??). Hope you get the pans you need in time to bake it. Thanks for getting in touch. Cake came out perfectly – thank you for a great recipe! Everyone at my daughter’s birthday was very impressed! I’m so pleased it went down well with everybody, Kathy, it’s one of my favourites. I totally fell in love with your beautiful cake and knew I had to make it for my son’s 30th birthday! I even ordered 3 new 6″ pans so I could make it just like yours. I had trouble with the bake – in fact, I ended up making the cakes twice because my first attempt resulted in 2 of the layers falling into an ugly mess. They baked up quite nicely the second time and left me with quite a showstopper! When the cake was sliced and those beautifully colored layers peaked out from the fluffy marshmallow buttercream, everyone was very impressed. I can’t even remember the last time I received so many compliments. The cake baked up a little dense and heavy – not light and fluffy like I expected – so I might have done something wrong the second time too, but the flavor and appearance easily made up for any baking flaws on my part. After reading thru the comments, I think I may have let the chocolate sit too long after melting. I melted the chocolate first as stated in your directions, but I’m not a speedy baker so I took too long to get to the step where I actually used the melted chocolate. It seized up a bit when I mixed the tablespoon of batter into the chocolate, so I probably overworked the batter trying to combine them. The cake was such a hit however, that I’m definitely trying it again! Thank you so much for the recipe and your beautifully tempting pictures. 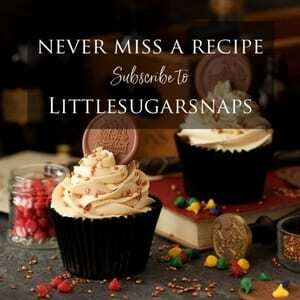 Your photography and staging is as inspired and wonderful as your baking! Hi Lisa, thanks for getting in touch and I’m delighted to hear that you and your family enjoyed the cake. Working with chocolate can be a little tricky until you are used to it. My chocolate tends to sit about 7-10 minutes after I’ve melted it before I use it. It’s important to mix that tablespoon of batter into the chocolate really quickly though (forget about being gentle) so that it doesn’t seize. Once you add the mix back to the rest of the batter that is the time to be gentle. It could well be that due to the chocolate seizing the batter was a little over-worked. That would certainly affect the texture of the cake. However, it could be old baking powder (it loses it’s potency over time) or a bad batch – I once opened a brand new pack and got to failed bake number 3 before I finally worked out that the problem was the baking powder. A bad batch wouldn’t happen often though, so I’d guess that it was most likely a little overworking or old baking powder. Do you know what happened first time around to leave 2 layers messed up? 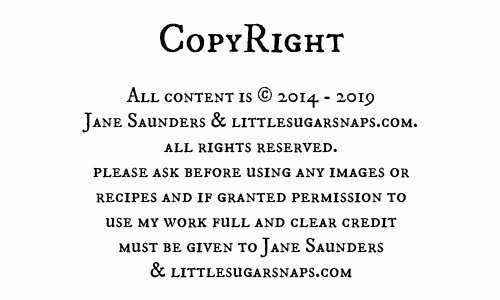 Thankyou Lisa, for taking the time to comment and for sending me your photos – you did a great job and I’m so thrilled you’ll be making it again. Thanks again for all your helpful tips and advice! You are most generous with your time and your knowledge. I’m not sure what I did wrong the first time to cause 2 fallen layers. I am just going to write it off to trying too hard. I knew that there would be other cakes at this party and I wanted mine to be the star! When I put a lot of pressure on myself to make something “perfect” I usually end up making a mistake or two! 🙂 I am so grateful to you for sharing your stories of an occasional fail. Knowing that someone with your talent and experience doesn’t always get it right the first time gives me the courage to shake off the disappointment from a mistake and keep going! You are truly an inspiration on every level! PS… thanks for bringing up the possibility of old baking powder. Mine isn’t past the expiration date, but it’s been in my baking cabinet for quite a while. I am definitely testing it before baking anything else! No problem Lisa. Bad baking days are like bad hair days – they spring up on you just when you least expect it and when the bake is more important than usual 🙁 Oh and speaking of baking fails I have a recipe from a very famous baker that I cannot get right – I’m sure it’s me, misinterpreting something, rather than the recipe at fault. Thanks Alice, so please you like it. Ovaltine is a malted chocolate drink – it comes in powder form. Do you have an equivalent product where you are or maybe malted milk powder? I haven’t made the cake using malted milk powder but if you substitute it in I think it will work out fine – it may just be slightly lighter than the cake I photographed. I hope this helps – happy baking. Hi Alice, of course I’ll try to help. It’s really strange that the white came out perfectly but the other 2 were dry and crumbly. Can I first of all check that you made the batter up and divided into 3 before adding the chocolate? Assuming you did that rather than mixing each layer seperately, there are several reasons a cake can turn out dry. Oven temperature can be a big factor – did you bake all 3 cakes together or did the white one go into the oven separately from the other 2. Ovens can be pests if the temperature fluctuates. Another factor can be undermixing of the cake batter – I wonder if somehow the milk and plain cakes were less well mixed than the white chocolate? Another possible reason could be that the milk and plain chocolate cakes spent longer in the oven than the white. My final thought would be the chocolate used – I used regular white, milk and plain chocolate rather than cooking chocolate which tends to have a few different ingredients to normal chocolate. Hopefully one of these reasons will resonate. 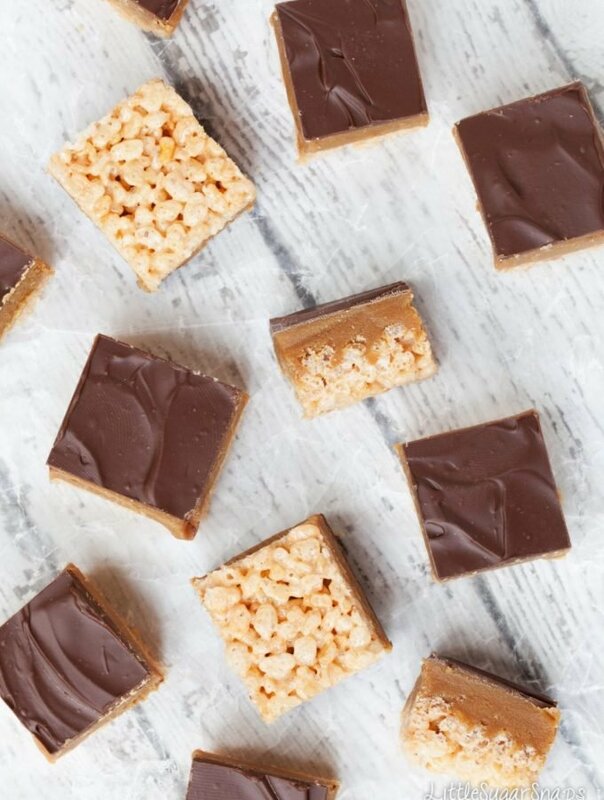 I hope you’ll give this recipe another go too – I’d love you to enjoy it at it’s best. Did you find a substitute for the ovaltine? Hi Paula. I don’t see why not. I usually end up making mine in advance then storing on the side – I have a large plastic salad bowl I can flip over to cover cakes like this to keep it clean. Failing that if you have a cake box that is tall enough go for that. Hope you enjoy it. I’d like to make this for my daughter’s third birthday. She’s asked for red icing on her cake. Will this buttercream hold up to piping if I wanted to do some red accents around the edge? Thanks! Hi Maria, that sounds fun. I don’t think you’ll have any problem piping it. Can I make a couple of suggestions – if you think it’s too loose to pipe straight away let it firm up in the fridge for a short time and maybe try piping a little bit first (off the cake) to see how you get along. 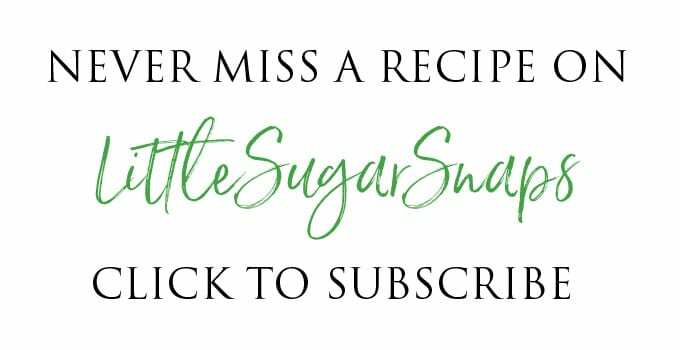 Hi Jane, I have just come across this and after I stopped laughing at your chocolate explosions I thought I would offer some advice 😊 I make sugar bowls with balloons and after a couple of colourful sugar explosions I found that filling the balloon with cold water stops it from exploding! I hope you don’t give up on pinata domes. HI Jane – how many do you think it would feed at the larger size. Need a birthday cake for 25 people and my 10 yr old daughter is making it (with my help!)! Hi Lara, how lovely. I’d say the 6 inch layer cake would serve 10-12 comfortably whereas the 8 inch layer cake would serve 16-18. I honestly think you’ll struggle to get 25 servings from it (sorry). If you go ahead and bake it, have fun. My tip would be to get your daughter to read through the instructions beforehand so she’s clear when & how to mix the chocolate into the cake batter to avoid it seizing up on her. 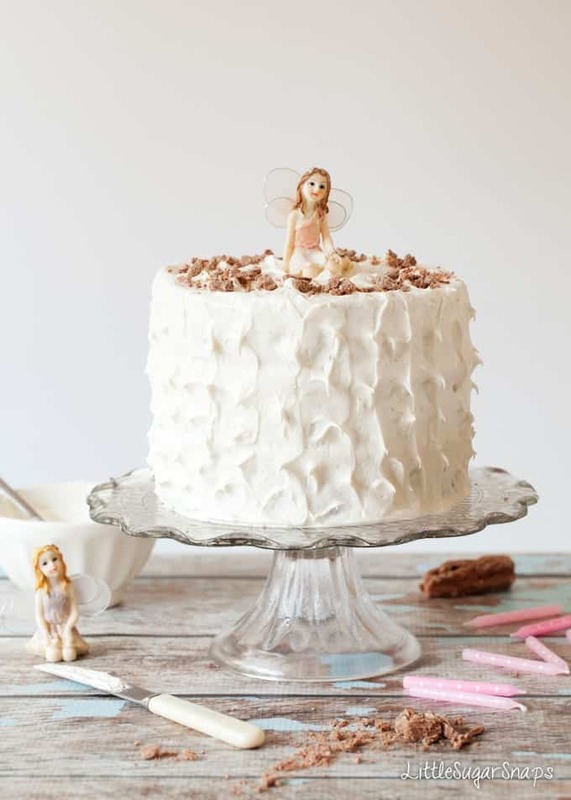 Gosh, this not only looks damn delicious the photos with the fairies are just gorgeous’! love, love, love! Thankyou so very much Tania. Hello,this cake looks amazing and would like to make it for my chocolate obsessed daughters birthday. I am just wondering if I can eliminate the marshmallow from the icing? I am planning on doing a chocolate ganash drip cake so am worried the marshmallow will make this to sweet. That sounds lovely. I can see why you might need to switch the frosting though. I’d switch out the marshmallow frosting for a regular buttercream or one from a drip cake if you have a recipe to hand. Happy baking. 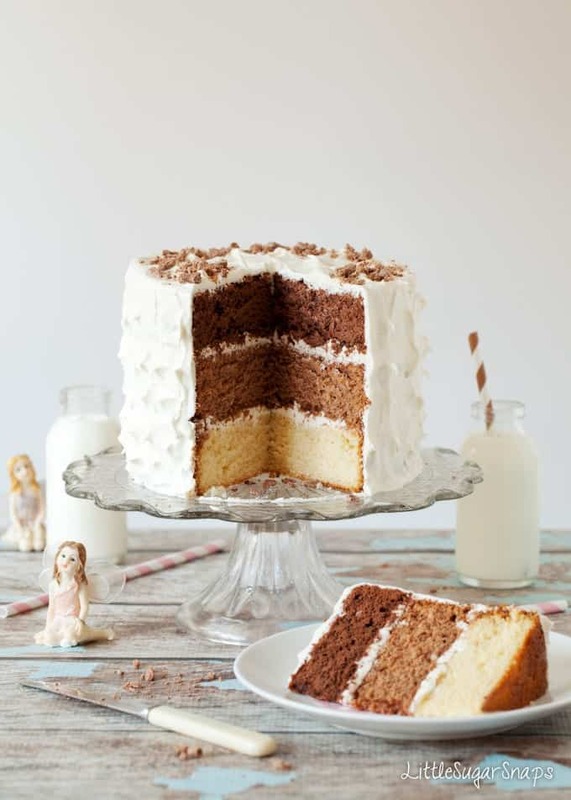 Your cake looks amazing and I’m in the process of recreating this (as a two tier version) for my niece’s Christening cake, however the milk chocolate layer is proving problematic for me. I have made several attempts and this layer always looks fine when baking but once out of the oven shrinks. I just wondered which Ovaltine it is that you use – the one that is to be mixed with milk or the one that is made with water? – this is the only thing I can think that could be making a difference, the white chocolate and dark chocolate layers have baked perfectly and I’m at a loss with this but don’t like to give up! Hi Lauren, sorry to hear that the malted chocolate layer is misbehaving. How strange. I baked mine with the original ovaltine, which requires milk. Are you using the same flour, baking powder etc as with the other layers? Everything else equal I’m at a loss as to why this layer keeps shrinking for you. Fingers crossed the change in powder works. Hi, I love your cake looks amazing. I recently started to learn how to make cakes, I will definitely make this. Hi, I want to make this cake for my sons birthday party. I want to make double barrel cake with six layers. Will his recipe produce a cake that is dense enough be stacked and not topple over? Wow, that sounds like an epic cake. Lucky boy! The texture is very much that of a typical sponge cake – I’ve never attempted to stack a cake more than 3 layers high, so I can’t say for certain if it might topple. I’d suggest using cake dowling to offer support to be on the safe side. And perhaps make the bottom 3 layers slightly wider than the top 3 layers of you have a variety of baking tins. Hope that helps. I love this cake, I made it for my birthday last year and it turned out great! Well, I’m not sure what’s going on now, but I made this cake for my sisters birthday a couple of weeks ago and it stuck to the pan horribly and fell all apart. I ended up having to cut the cakes into chunks and serve it as a trifle. It was a hit and the cakes were delicious, but I was really looking forward to serving the cake the wai yt was intended. I just tried to make the cake again, and the same thing has happened. I follow the recipe to a T…. except I make it in the 8” pans. Help, please!! Oh, how strange. It sounds like an issue with the pans, to be honest. When you say the cake stuck to the pan, do you mean the base or sides or the pan? Did you grease and line the pans with baking parchment? I’ve had trouble with greaseproof paper rather than parchment and likewise, I’ve had difficulty making cakes if my pans get too old and loose their coating. Even with new pans I always grease and line with parchment. Hope my thoughts help. I’m sure that will make all the difference. Pesky tins. BEAUTIFUL CAKE , DO YOU THINK I COULD COVER THE OUSIDE WITH CHOCOLATE GANACHE INSTEAD OF THE CREAM CHEESE ICING AND JUST HAVE THE CREAM CHEESE TO SANDWICH THE LAYERS TOGETHER. Thanks Angela. I don’t see why you couldn’t customise the icing to your tastes and requirements. Let me know how it turns out. Thankyou so much for taking the time to tell me how you got along. It makes my day to hear from happy readers.